Proponents of raising the federal gas tax argue it has been 25 years since the last hike, the current tax no longer covers what’s being spent on roads and transit, and future economic growth requires a 21st century transportation system, not an aging or outdated network of roads, bridges and tunnels. Raising the tax by 5 cents a gallon each year for five years would be a tough vote if for no other reason than it would eventually more than double the current 18.3-cent gas tax rate, which was last raised in 1993. House Transportation and Infrastructure Chairman Peter A. DeFazio, a Democrat from Oregon, has suggested Congress may have to do more, however. And President Donald Trump may agree with him, or at least he did last winter, according to Delaware Democrat Sen. Thomas R. Carper. DeFazio did not explain how he arrived at more than six years, and an aide said he was not saying he opposed the increase, just arguing for a plan he supported in the last Congress to leverage future increased revenues by bonding against them to spend the money more quickly. Data from the Congressional Budget Office and the Joint Committee of Taxation illustrate what DeFazio was describing. The current five-year transportation law, which runs through September 2020, was balanced by transferring $70 billion from the general fund, which essentially means it was added to the national debt. Doing the same thing for another five years would require finding $94 billion, the CBO estimated last year. The reason for the higher figure is the cost of projects goes up while the existing tax levy generates less revenue because more efficient vehicles travel farther on every gallon of gas. A growing number of vehicles also use no gas because they run on electricity or hydrogen fuel cells, but they currently comprise about 1 percent of the total fleet. 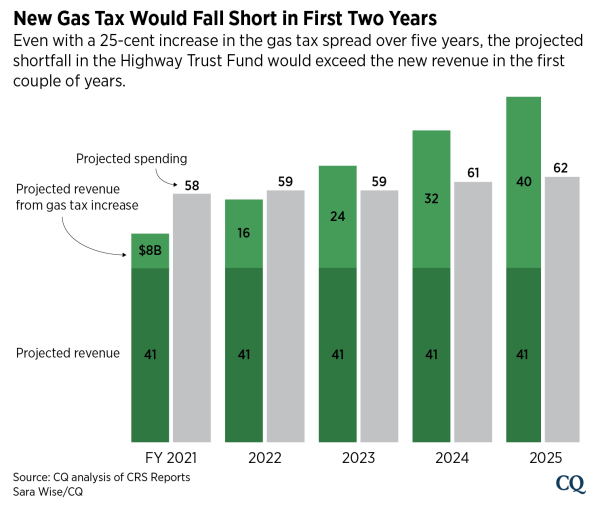 In 2015, witnesses at a Senate Finance Committee hearing said the JCT estimated that a 1-cent increase in the gas tax would generate $1.7 billion a year in the early years, and that amount would decline to $1.5 billion within a decade. The CBO estimated last year that in 2021, the existing gas tax and other revenues such as diesel taxes that go into the Highway Trust Fund would generate $41 billion, while projected spending for highways and transit at current levels would be $58 billion. That means there’s a shortfall of $17 billion in the first year after the current law expires. Using a mid-range estimate of $1.6 billion in revenue per penny of increased tax, a 5-cent increase in 2021 would raise $8 billion, or $9 billion less than necessary to cover the shortfall. In 2022, if the tax were 10 cents higher than it is now, revenue would generate $16 billion, or $1 billion less than projected spending. A full 25-cent increase would generate about $40 billion in additional revenue, which combined with the existing tax would make about $80 billion available to the trust fund. The American Society of Civil Engineers said in 2016 that the 10-year gap between the need for surface transportation projects and available funds — which includes state and private contributions — was $1.1 trillion. Carper told the APTA conference that he suggested raising the gas tax by 4 cents a year for four years last year when he sat across from Trump at an infrastructure meeting. Carper said Trump repeated that statement several times during the meeting, which was with lawmakers on key committees that handle infrastructure issues. Carper said he left the meeting and told reporters outside the White House about what Trump had said, but a Republican colleague, Sen. James M. Inhofe of Oklahoma, followed him and said he didn’t remember Trump saying that. “I called [DOT Secretary] Elaine Chao that night and she remembered it. She said the president’s been talking about it for weeks,” Carper told the conference. The White House would not confirm Trump’s position at the time, and after conservative groups blasted the proposal, Trump never made a public statement in support of the increase. Congress also did not act on the administration’s call for a major infrastructure package last year. Trump renewed his call for Congress to send him an infrastructure bill in his State of the Union speech this year, and urged the nation’s governors when he met with them in February to pressure Congress to send him a bill. His fiscal 2020 budget proposal called for cutting the Department of Transportation’s budget authority by 19.2 percent, however. Instead, it renewed a call for states and the private sector to pay more of the share of projects. Mortimer said the U.S. Chamber estimates that about half of the new revenue from a 25-cent increase over five years would go to plug the shortfall in the trust fund, but the other half would be available for increased spending.